The Cardiff City stadium was officially opened on 22 July 2009 and is the second largest ground in Wales trailing only the Millennium Stadium. When opened it was very similar to the builds at Reading and Coventry, with three sides of the bowl shaped stadium being a single tier, with a second tier added to the main stand. Since then, a second tier has been added to the East Stand opposite the main stand. There are no bad seats in the house. 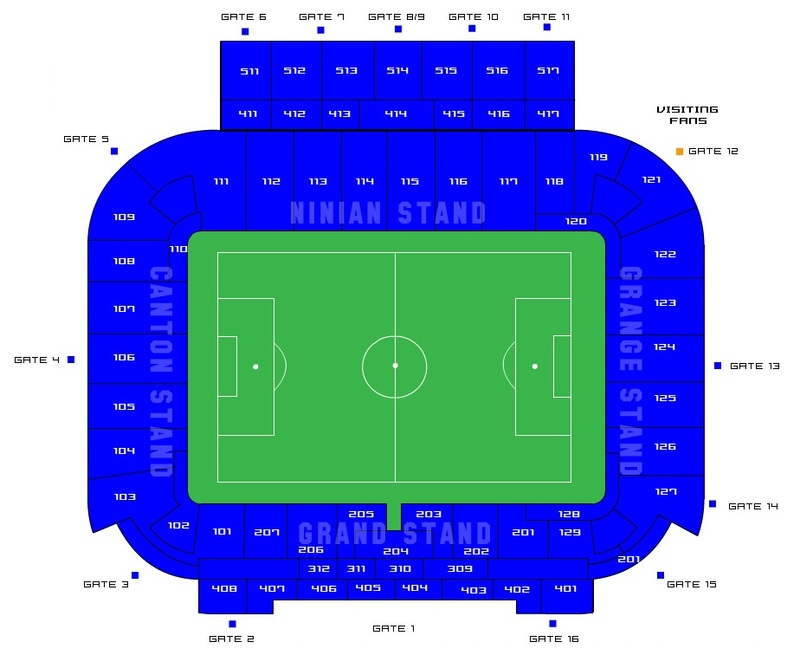 Up to 2,000 visiting supporters can be accommodated in one corner of the ground between the Grange and Ninian stands. Views are excellent and facilities and leg room are also as good as you'd expect to find from a stadium as new as this. Home fans are well known for hostility unfortunately so it's best to keep your wit's about you and any colours are best kept covered, in and around the local vicinity including the town centre, until inside the ground. The town centre is your best bet for getting a few drinks before the game. However, if you're an away fan be sure to keep colours covered as there's very rarely any visiting supporters friendly pubs. There are a few pubs around the ground such as The Ninian Park but even without any away fan strings attached you're advised to seek a beer a little further away. Also in the town centre are many chain restaurants and fast food establishments so you wont be short of places to go. In fact, the Wetherspoons in the centre serves a good array of food and drink to set you up well before or after the game. Parking is freely available at the stadium providing you arrive in good time. Street parking also exists in the surrounding streets. However, train and bus services are very frequent and reliable and allow easy access to and from regardless of the direction you're coming from. Cardiff has a central station where trains arrive from all over the UK. The station is right in the city centre and you come out into the central bus station. You can get local connections from here to the nearest / closest stations to Cardiff City's stadium, Ninian Park Halt and Grange town. It is a brisk fifteen minute walk to the ground from the central station and a steady ten minute walk from Grange town station; however Ninian Park Halt is only one hundred yards away from the ground. Ninian Park Halt is where the vast majority of home fans gather after the game to get trains back to the City centre and beyond, it is very crowded after a game. Travel: Got train into Cardiff Central which is bang in the middle of the city. Refreshments: There's plenty of choice for pre match drinks and food in the town centre, I went to the prince of Wales which is 2 min walk from station loads of Cardiff in there had some really good banter with them. Impressions: From the outside the stadium looks huge with the new tier been added to the Ninian Stand. Very impressive and by far the most attractive stadium in the Championship.easy to access and if you are driving parking is provided outside ground for away fans £20 for a car which I thought was good. Atmosphere: The atmosphere in the ground was electric loads of banter flying back and fore and what impressed me most was 99% of the Cardiff fans where wearing their traditional Blue tops. Facilities: Friendly staff and stewards I've come across loads on room in concourse for pre match and half time drinks. They have the best beer I've tasted in a football ground brains SA a Welsh beer at a reasonable £3.90 and the pies they do are Clarksville pies which is a mince pie which I haven't come across before but was top notch. Exit: Easy can kindle with home fans not one problem 25min walk back to city centre if your in car seemed no traffic problems to get on the M4. Enjoy: Apart from the result, 3-1 Cardiff, it was a fantastic day out in the Welsh capital would recommend anyone if you get the chance to go £30 ticket which is good for what you experience. Travel: We took a mid-morning train up to Cardiff from Wiltshire and arrived about midday. From Cardiff Central itself, you can catch a train to Ninian Park station for around £2-3 return that takes roughly five minutes. Once at the station, follow the slope down and cross the road, the stadium is straight in front of you and very hard to miss. Refreshments: We decided against the local pubs due to our away colours, but sat in the KFC opposite the stadium and chatted to a couple of the locals, who were very friendly. Service was quick considering it was a matchday and we had little trouble finding seats indoors. Impressions: The stadium itself looks smart and is obviously of Premier League standard. The Grandstand towers above the rest of the oval, and from the away end in the corner of the ground we had a fantastic, uninterrupted view of the field of play. The seating is set slightly far back from pitch side in my opinion, but nonetheless you can see everything clearly. The stadium inside is very aesthetically pleasing, with two large screens at either end displaying the score and information, and a further LED clock integrated into the wall of the Away End. It would have looked better at capacity though, a poor 11,000 attendance for a 30,000+ seater stadium, even if it is only the FA Cup. Facilities: The toilets themselves are clean, well-stocked and the best I have come across at a league ground so far. Leg room between the seats and the seats themselves are both very good. There were plenty of opportunities to get a pint, programme or Cardiff City merchandise. The club shop were welcoming to both sets of fans, as were the Supporters Club selling a variety of old Home/Away programmes from yesteryear. Exit: Exiting the stadium was a bit hectic, once you reach the station. With only one 2-coach train every half an hour, it was touch-and-go as to whether we would get on. Once we did, we were packed in like sardines - imagine fitting 35 people into your living room and you get the rough idea. The journey after that was fine, and the stadium itself was easy enough to get out of and away from. Enjoy: All things considered, Cardiff is definitely one of the better clubs I have been to. The attendance and their style of play was a little disappointing - the game rarely offered more than the occasional half-chance until the end of the second half, when Reading won 2-1 with a goal in the final minutes. However, the travel was among the easiest I have experienced, and the stadium itself is beautiful - a credit to English (or Welsh!) football league clubs. I'd recommend it to other fans, if you get the chance. 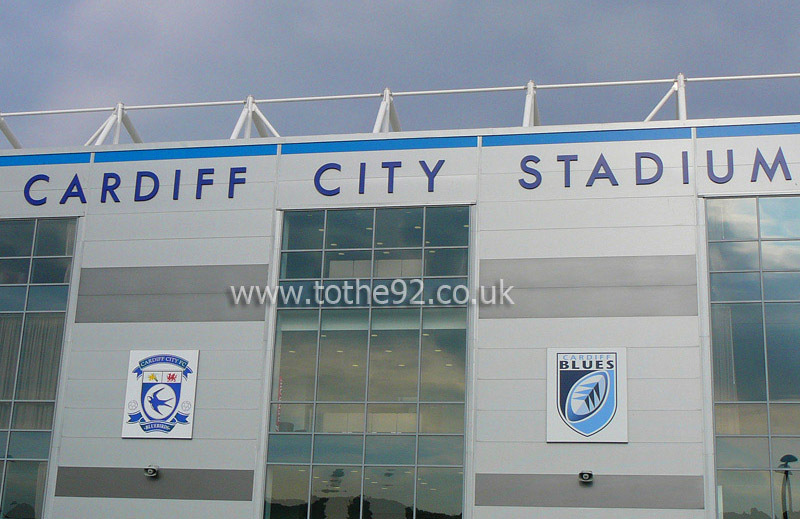 Have you been to Cardiff City's Cardiff City Stadium? To tell us about your experiences and to feature on the site, simply complete the fans review form below!